June 2015: Due to large restoration works by the "Bavarian Department of State-owned Palaces, Gardens and Lakes" the Schloßwirtschaft is closed at the moment. The renovation work is planned to take 3 years. Throughout this time, kitchen and restaurant are located in a rustic Alpine chalet. However, the beer garden is open and operates as usual! Schloßwirtschaft Oberschleißheim is located within the grounds of the Oberschleißheim Castle. The property has a long history and was originally a farm where the founder of Hofbräuhaus settled for his retirement in 1597. In the 17th century following the building of the castle, the Schloßwirtschaft (castle restaurant) provided catering to its workers and servants. Following the opening of a castle brewery as well as the introduction of a railway link to Landshut, Schloßwirtschaft Oberschleißheim became better known outside its castle walls. In 1912 a nearby airport was built and Schloßwirtschaft became a regular meeting place amongst pilots. Although the brewery does does no longer exist at the caste, Schloßwirtschaft Oberschleißheim maintains the tradition of serving their own staff food and beer. The approximately 1,000 seats in the beer garden are well-shaded by a dense cluster of chestnut trees. The serviced area on the terrace has less charming plastic chairs and sun umbrellas. The food stalls in the self service area offers typical Bavarian cold and hot meals. 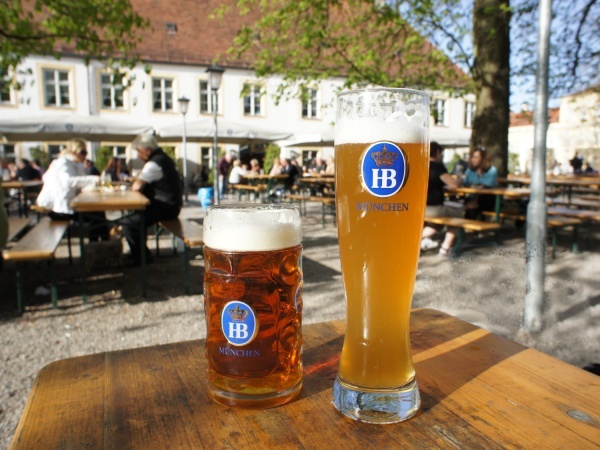 The Hofbräu beer costs €8.00 p/Maß (May 2017). While a Dunkel Weißbier (dark wheat beer) is sold in bottles, the regular Weißbier is served from the tap. The beer gardens offers a view of the main castle building, which is especially picturesque during the evenings hours when the sundown lights up the façade into golden yellow. 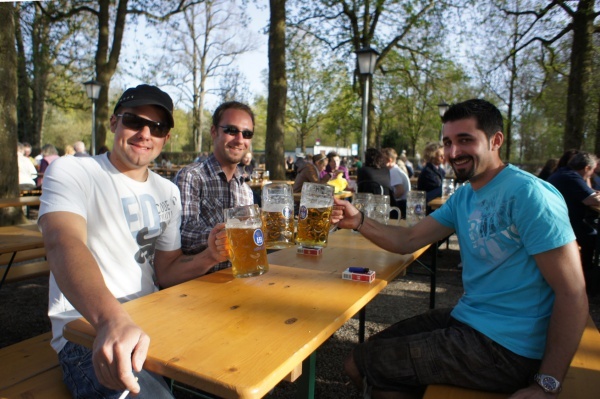 The beer garden is open daily during the summer from 11am until 11pm.